SM Group will acquire more companies, including overseas shippers, to beef up its status in the sector, its chief said Monday. The midsized South Korean shipping group has been taking over a series of financially troubled companies over the past few years, to emerge as a major player in the domestic shipping industry, currently under financial strain amid falling rates and a drawn-out slump in the global economy. SM Group, which was picked as the preferred bidder for STX Corp., a general trading company, last week, also purchased the now-defunct Hanjin Shipping Co.'s US-Asia route and other assets for 37 billion won ($32 million) late last year. One of its shipping affiliates, SM Line Corp., said earlier that it would begin its services on nine routes to Thailand, Vietnam, Japan and other regions with a fleet of 12 container ships. The company said it aims to log 3 trillion won in sales within five years. 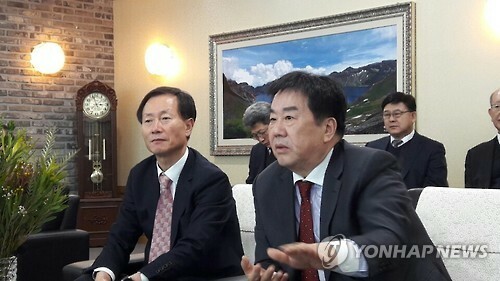 "We will regain the fame held by Hanjin Shipping and are willing to take over foreign shipping firms as well to expand into overseas markets," Woo Oh-heun, chairman of SM Group, told Yonhap News Agency. In 2013, SM Group also acquired Korea Line Corp., the country's No. 2 bulk carrier. Korea Line currently operates some 30 vessels, hauling goods, such as iron, ore, crude oil and cars, and its financial status drastically improved after being taken over by SM Group. SM Group also has bought other companies, including TK Chemical and Namsun Aluminum. The business mogul expressed confidence that SM Line's sales will be drastically hiked to a level of Hanjin Shipping, whose annual sales have reached some 10 trillion won. For this year, SM Line aims to generate 400 billion won in sales, and annual sales of 3 trillion won in two or three years. Woo said his group will make efforts to synergize the affiliates.